The same is true of the Zazzle Affiliate Design Requests forum, where Zazzlers more serious about affiliating make themselves known. It’s one step up from promoting in the ShowMe forum and there’s less competition there. The next step up for you, after the Design Requests forum, is to reach the types of people who use the Nifty Promo Control Panel. They are all actively affiliating, promoting mostly other people’s designs. Sure, out of the hundreds who use it, not all are truly affiliating. Many are, but more those who haven’t been using it for long are probably still focussed on their own stores and collections. How long will it be featured for? It’ll be featured for a minimum of four weeks, during which time it should be seen by lots and lots of affiliates who are actively promoting. As the expiry date gets closer, get another collection ready and come back to place your next order. How do I get my collection featured? Getting your collection featured for four weeks costs only $4 for 1 collection or you can go large and get a second at the same time for only $3 more. 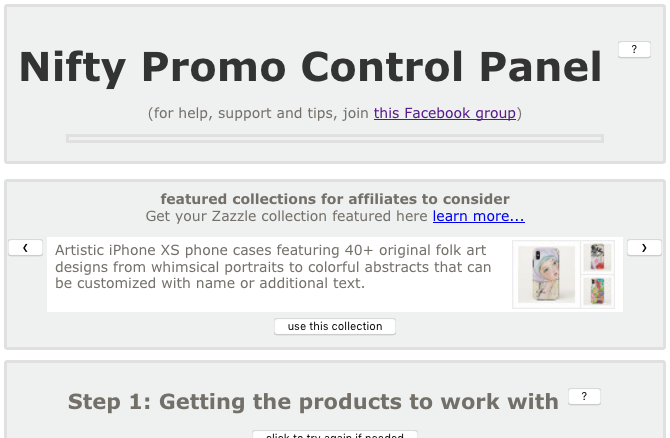 Simply visit your collection on Zazzle and get its link via the share button there. For the description(s) in the form below, remember that it’s affiliates you’re talking to, so speak directly to them with those 240 characters. How is a featured collection selected for display? Each time an affiliate visits the Nifty Promo Control Panel, a random entry in the list of featured collections is chosen for display. Once on the page, they can use the arrow buttons to move between entries. To ensure every entry gets its fair share of time in the spotlight, every time the affiliate changes something in Nifty, the displayed featured collection moves to the next. We can’t provide you with analytics but if it’s working for you, you’ll notice an uptick in the views of your products in that collection and, hopefully, sales. But do give it time. Note that you’ll only get views when peeps view promoted products, not when affiliates are using Nifty with your collection. Sometimes it’s much quicker than that. Of the affiliates who share such info, two days was the quickest from promoting to selling we know about.